Assist’ visits to dhows and other small craft working in the area. The prime purpose of these visits is to help local fishermen and other mariners in need of assistance, while also providing reassurance that HMS Monmouth and other coalition warships in the area are there to keep the region free of piracy. These visits are conducted by the Ship’s “blue” boarding team, consisting of volunteers from the Ship’s Company, in conjunction with the “green” boarding team of embarked Royal Marines. During these visits, the boarding teams will discuss the challenges faced by the small boats operating in the region and are often able to learn the sort of valuable grass roots information that the Ship’s sophisticated sensors are unable to detect. 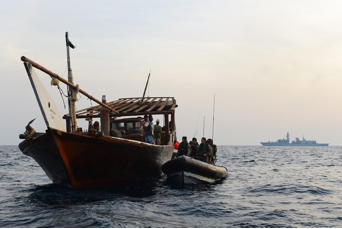 “Over the course of an average day we will conduct between 5 and 20 Approach and Assist visits to fishing and trading dhows of various sizes”, said Deputy Logistics Officer and Boarding Officer Lt Chris Marsden RN. “The boats’ crews are generally pleased to see us and we are often able to help out by providing them with supplies and information ranging from deteriorating weather conditions to the latest cricket scores! In return the crews are able to provide us with details of any suspicious activity in the area, which we can then act upon”. Operations, and remains prepared to respond to any crisis that may develop.